Received a copy from Netgalley, thanks to: Atria Books, this in no way influences my honest opinion. This books left me, at an extremely loss of words. Most of the time there are lots of words to decribe a book. What I liked about it, what I didn't like. This book is just right, it is perfect in many ways. Not only could I quote the intire book for being written so well, I also lived the characters and the story was just so realistic that you might even start wondering if it were your own memories. I have tried reading Hopeless before, I got approved via Netgalley to read it, last summer to be accurate. The problems was that at the time I could not handle it because my own life was a mess. I just couldn't handle a book that was so heavily emotionally charged. So I left it in the archives and mostly forgot about it. Now that I am feeling much better and my messes have been cleaned up I thought to give this book another chance. And let me tell you, before you start reading, buy a box of tissues you will need them! You will ride the emotional rollercoaster, on this one. If you haven't read this or even heard about it, please give this awesome book a chance you will not regret it. This book is does not have insta-love like so many other in this genre. The relationship between Sky and Holder is more a love-hate kind of thing, clouded by lots of other emotions. Emotions we will only get the grasp the meaning from at the very end of the book. Only then will you understand why they acted the way they do. Wow, this review is not easy to write without spoilers, but I think I am doing well, so far. I recommend this book to everybody who loves realistic fiction with love but also heavy topics like abuse and suicide. Again this book really is an emotional rollercoaster, and it's really a ride I enjoyed and closed into my heart. Therefore, 5 skaters! "Like Holder said, at such a young age you believe that adults are all so honest and truthful, you never even think to question them." "Believe me. I have no idea how to handle you Holder. I just take you one scene at a time. " I was listening to a cd of Laura Marling, just as background music while I was doing whatever. Then I started to listen to the lyrics of this song and I thought it was really fitting for this book. I was astonished at how good it was! 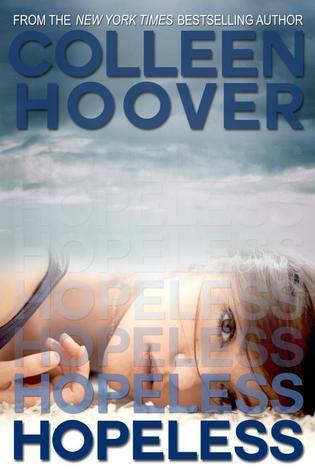 Definitely going to read more by Colleen Hoover! I heard Slammed is really good too!